The best of both worlds – our cheesecake brownie has 3 luscious layers starting with our chewy chocolaty brownie, followed by our creamy cheesecake layer, then topped with our ever so yummy cream cheese, buttercream frosting and weighs in at approximately ¼ lb. each. Enjoy! 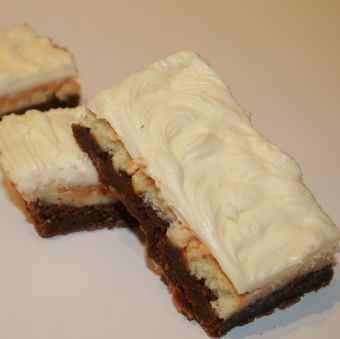 Size: -- SELECT -- Cheesecake Brownie 6 ct.Cheesecake Brownie 9 ct.Cheesecake Brownie 12 ct.